Casket maker has increased payout every year since 2008. Perhaps best known for its Bastesville casket division, diversified industrial company Hillenbrand (NYSE:HI) announced yesterday its third-quarter dividend of $0.195 per share, the same rate it's paid for the past three quarters when it raised the payout from $0.1925 per share. The board of directors said the quarterly dividend is payable on June 28 to the holders of record at the close of business on June 15. 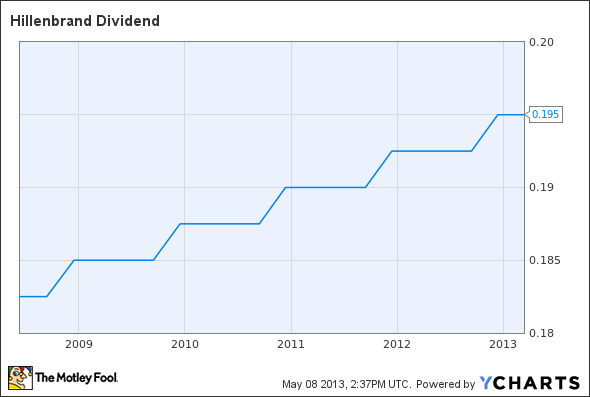 Hillenbrand has paid a quarterly dividend consistently since 2008, increasing it every year. The regular dividend payment equates to a $0.78-per-share annual dividend yielding 3.3% based on the closing price of Hillenbrands stock on May 7. HI Dividend data by YCharts.